176 pages | 64 B/W Illus. Convexity is an ancient idea going back to Archimedes. Used sporadically in the mathematical literature over the centuries, today it is a flourishing area of research and a mathematical subject in its own right. Convexity is used in optimization theory, functional analysis, complex analysis, and other parts of mathematics. Convex Analysis introduces analytic tools for studying convexity and provides analytical applications of the concept. The book includes a general background on classical geometric theory which allows readers to obtain a glimpse of how modern mathematics is developed and how geometric ideas may be studied analytically. Featuring a user-friendly approach, the book contains copious examples and plenty of figures to illustrate the ideas presented. It also includes an appendix with the technical tools needed to understand certain arguments in the book, a tale of notation, and a thorough glossary to help readers with unfamiliar terms. This book is a definitive introductory text to the concept of convexity in the context of mathematical analysis and a suitable resource for students and faculty alike. "The goal of this user-friendly and self-contained book is to introduce and study the notion of convexity of sets and functions in Euclidean spaces with a perspective that is closer than usual to the approach and the tools normally prerogatives of the mathematical analysis setting." Steven G. Krantz received his PhD from Princeton University. Dr. Krantz has taught at UCLA, Princeton University, Penn State, and Washington University in St. Louis. For five years he was the department chair at Washington University. Dr. Krantz has received the Chauvenet Prize, awarded for outstanding mathematical expository writing. He has also been awarded the Kemper Prize and the Beckenbach Book Award. 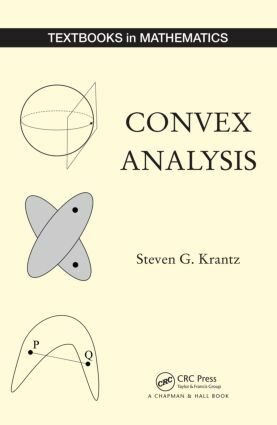 Dr. Krantz is the founding editor of the Journal of Geometric Analysis as well as Complex Analysis and its Synergies. He has written nearly 195 scholarly papers and more than 75 books.